The Messermeister San Moritz Elité knife collection have a completely molded, ergonomic and contemporary handle. The blade, bolster and tang are one-piece, hot-drop, hammer forged from a single billet of the finest German steel alloy. Featuring a unique personalization plate, this series of knives will be a statement piece in any kitchen. San Moritz Elité knives are handcrafted individually by 3rd and 4th generation cutlery artisans in Solingen, Germany. 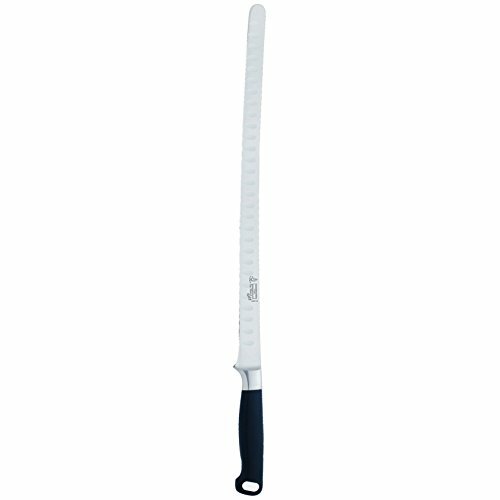 The Messermeister San Moritz Elité 12" Kullenschliff Flexible Fillet Knife has a long, narrow and extremely flexible blade that cuts extremely close to a spine, bone or other hard surfaces. An excellent blade for the day-to-day demands of a commercial kitchen but useful for any fishing enthusiast. The alternating kullenschliffs (a.k.a. kullens, hollows or grantons) on each side of the knife reduce drag and prevent items from sticking to the blade.